Last month's theme for the stamp club card swap was anything beach-related with a watercolor background and an embellishment. Since I was in Montana, I wasn't able to get it done, but this is what I came up with. This card was inspired by a card I received from Cheryl Wilcox (Love to Stamp & Scrap). Palm trees, sand, flip-flops, and a glorious sunset sure makes me think of the beach! See the tiny flowers on the flip-flops? That's from the pieces leftover when you use the Lace Ribbon Border Punch! Ya know, I wasn't too enamored of the Calypso Coral when I first saw it, but it sure is growing on me, and it is gorgeous with the other new In Colors! Ahhhhhhhh....I'm relaxing on that lovely beach right now!! Love it!!! Gorgeous card and brilliant use of the punchies from the Lace Border Punch! Great lookin' card! Love the details (images, texture,etc.) on each layer and tfs the tip of the punch-out! Love it! Hey Cindy, thanks for the link back - but it's really a card my upline, Jeanne, designed for a workshop last summer... I just made a ton of them because I liked it so much. Love what you did with it, though - that background is great! Ooooooo, very nice! 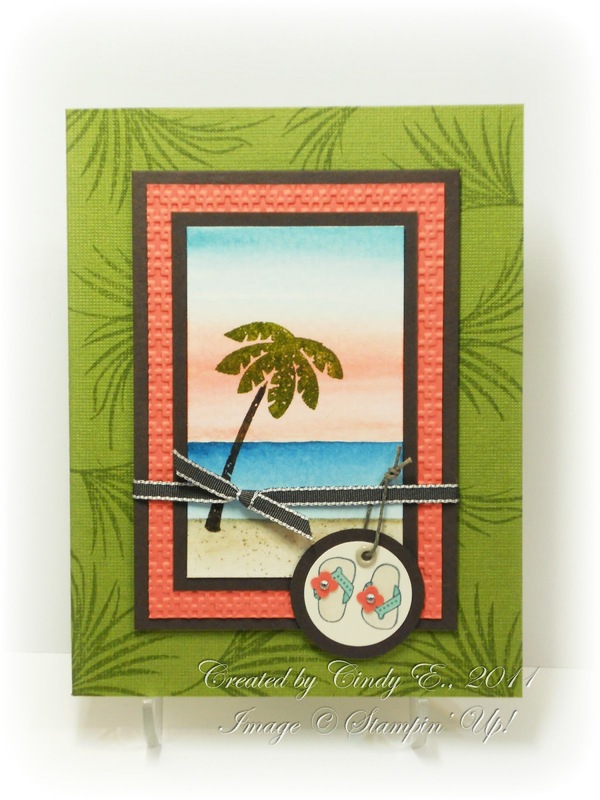 Great use of the flip flop stamp image! I love the flip flop tag. I am all ready for the beach!